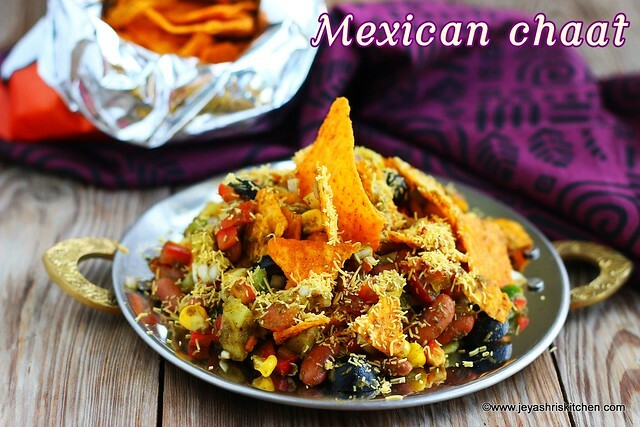 Mexican chaat, is a fusion chaat recipe, similar to the popular Indian chaat Bhel puri. 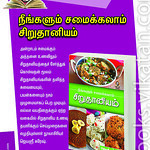 Yesterday when Varsha was telling about some Cooking without fire competition in school, i gave her this idea. 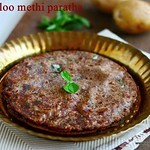 Today morning i sent all the ingredients to her for the competition and kept one more portion for my post too. 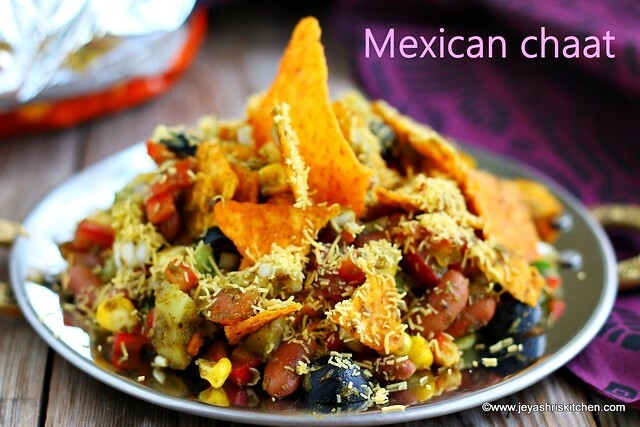 As most of the kids like Doritos |nachos, this chaat will be a sure winner among kids. 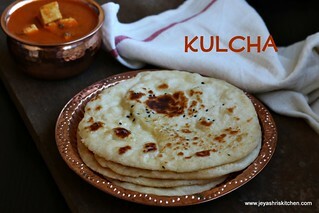 I have given few variations for this recipe in the notes section. Scroll down to see it. 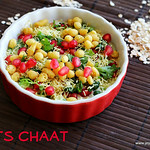 This chaat recipe is a perfect one for parties, you can keep everything ready and just mix everything at the time of serving. 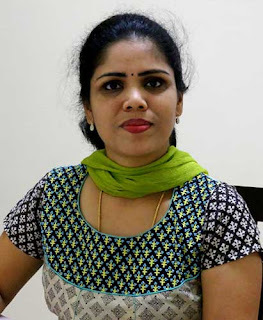 Cook the over night soaked rajma, potato and sweet corn in a pressure cooker. Chop the onion,capsicum and tomato finely. Cut the olives into circles. Cut the potato into small cubes. In a wide bowl add the red kidney beans, potato, sweet corn, olives, capsicum, onion and tomato into it. Add the green chutney, sweet chutney, chaat masala and roasted cumin powder. Slightly crush the Doritos and add it to the bowl. Add it to the serving plate and garnish with sev. No need to add salt, as chutneys, chaat masala and Doritos has salt in it. Instead of the Indian style chutney you can add tomato ketchup and chilli sauce. Doritos can be replaced with potato chips too. 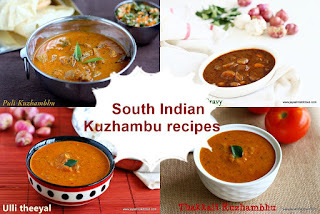 Even you can make with Thattai or murukku too. 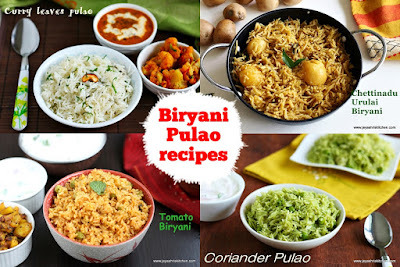 You can skip chaat masala and cumin powder and add chili flakes and oregano powder. You can use black bean too instead of red kidney beans. Thinly sliced jalapenos can be added. A dollop of sour cream or thick yogurt can be used for garnishing instead of sev. You can add few pomegranate too. 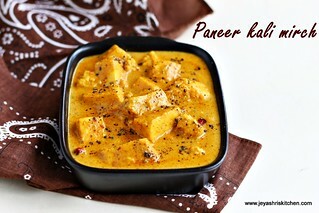 I want to make this for 6 people. 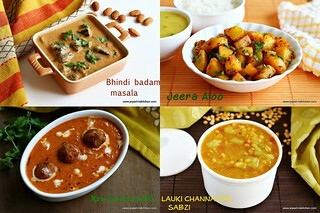 Can u help with the proportion of each ingredient? Hi triple the recipe, it will be fine.